Take the usual precautions in gathering the Yateveo shoots, by first exhausting the plant for safe harvest. It is worth noting that a tree that is still somewhat “frisky” yields more flavorful leaves. Be careful! Dice or shred all ingredients. Toss together with vinegar and oil. 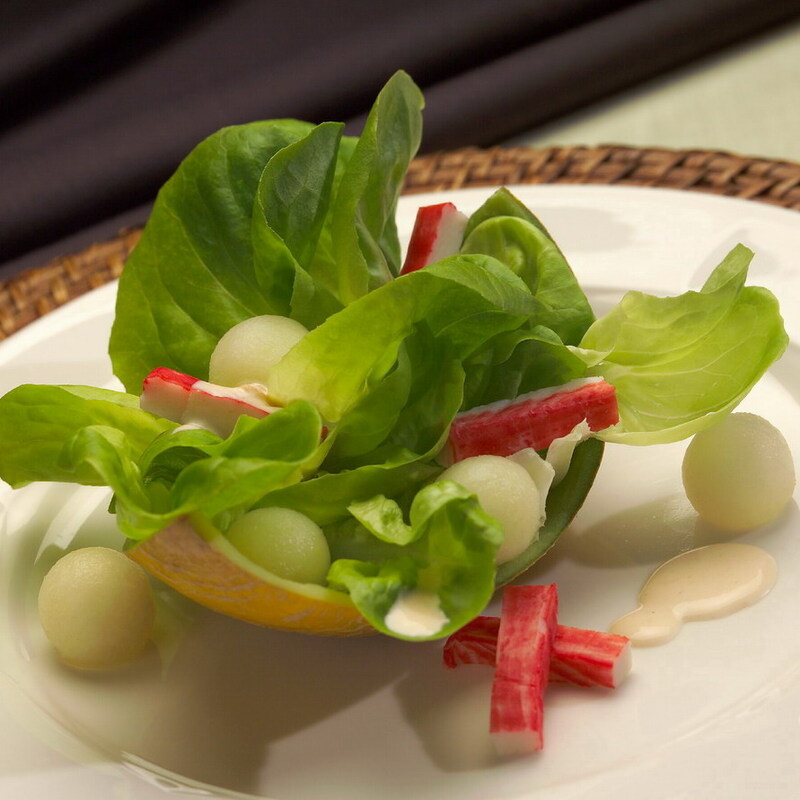 Arrange on small side plates, and garnish lightly with sawdust. Serves 8 Greys, 2-4 members of the Chromatocracy, or 1 Prefect, unless suddenly appropriated by an Apocryphal Man. Jasper Fforde has reviewed this recipe, and proclaimed it “good”. If this recipe puzzles you, please find and read Fforde’s ‘Shades of Grey’. You’re welcome! ‘The Calamari Kleptocracy’ – A New Audiobook! ‘The Calamari Kleptocracy’ is a loss of innocence tale, the story of Thor Gunderson, a cheerful and congenial young man whose life is about to take a series of wild jolts and shocks as the people in his world each, one by one, bring Thor lessons in the complexity of human nature, and the existential character of the universe in general. Sansone’s novel is ingenious for its capacity to craft a seeming allegorical America, which ultimately proves to be barely an allegory at all. It is, rather, a clearer vision of the plight of our nation in economic turmoil. Common people work hard, but don’t prosper. The rich get richer, and use the common folk as their pawns. The land of opportunity exists only as a memory of a dream. The view-points and writing of Sartre, Brecht, and Ionesco all echo in this novel, but with their European existentialism adroitly imported and adapted to our native landscape. That mirror now reflects the hardships and harsh realities of an America enduring a crippling economy, turbulent sectarian divisions, encroaching Fascism, and a corruptly parasitic oligarchy. But don’t be dismayed by the weighty underpinnings of this story. For all the complexity of the novel’s philosophical bones, the surface of the tale is light and humorous, and parades characters and events which are by turns sweet, amusing and colorful, before leading us with, at times, brutal honesty to the way things really are. And how is that? Big business manipulates and gobbles up individual businesses. Individuals are manipulated into collectives against their own best interests. “Opportunity” has vanished from the American landscape. The prosperous prey upon an ever-shrinking and downwardly mobile middle class, an astonishing number of whom enter into incarceration in for-profit prisons. And yet there is always to be found light within human life: This was one of Ionesco’s clearest truths, which Sansone, too, demonstrates over and again, with a precise eye for the light, color, and minute details that fill the space in which his story unfolds. Another brilliant aspect to Sansone’s story-telling is that he never demonizes anyone. All his characters, even the most corrupt, are complexly human mosaics of traits good and bad; full and simple at once. For that, and many other reasons, I loved working on this audiobook presentation of Mr. Sansone’s novel. Find it today at Audible.com ! 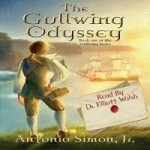 Narrated by Elliott Walsh; available now at Amazon.com! A sample from ‘Headwind’, the audiobook. Old friends who know me well are familiar with my theatrical past. There was a time, in another life, when I majored in Dramatic Arts at Boston University. I studied and worked hard at becoming a professional actor. I’ve been in plays and musicals off and on for many years. 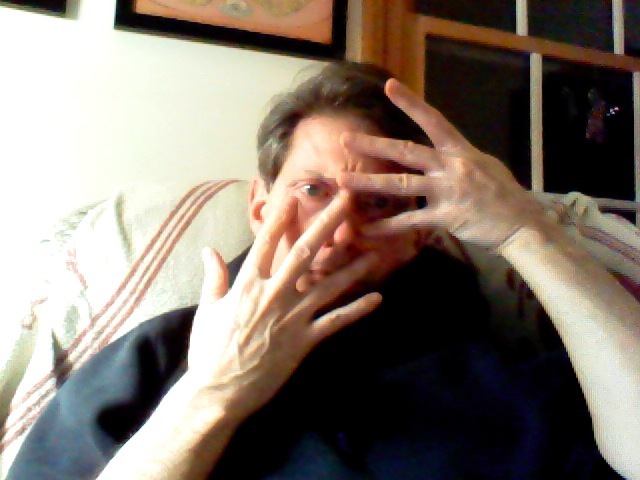 I’ve performed in New York City and Boston, albeit not profitably. My interest in theatre makes me keenly appreciative of good work when I see it, both the writing and acting; mostly in watching films or broadcasts, these days. There’s scant opportunity to perform, though, in part because where I live is such a long drive to anyplace where a scrap of performance is happening. After a day at the hospital, it’s unthinkable to drive almost an hour north or south to keep a rehearsal or performance schedule, so I’ve steered clear of auditions. There has been a bit of “flash theatre” once or twice, when I could participate in a 24 hour play project, most recently in Brunswick a few months ago, but that’s another story. What I have done to exercise those old actor’s reflexes and skills is to try my hand at auditioning for audiobook narration. A while back a writer friend brought ACX to my attention. ACX is the Audiobook Creation eXchange, a division of Audible.Com, which is, in turn, a subsidiary of Amazon. They are a clearinghouse for Authors, Rights-holders, Narrators, and Producers, and mediate between them to foster the recording and marketing of new audiobooks. It’s really an amazing idea, and has garnered the support and enthusiasm of first rate authors, like Neil Gaiman or Janet Evanovich, and top o’ the line publishing houses, as well. It works like this: If you think you have what it takes to narrate someone’s book into a finished product, go create a narrator/producer’s account at ACX . You will be encouraged to flesh out your profile, and upload audio samples of your voice, which authors and rights-holders can find and listen to. You can also browse a significant catalogue of projects seeking a narrator. They can be searched with filters leading you to projects that fit your gender, voice-style, and age. You can also filter for fiction vs. non-fiction, or for specific genres, such as mysteries or sci-fi. The projects will be presented with myriad information; date of publication, length, author’s notes, etc, and an audition script will be attached. I hunted up a number of projects I thought would scratch that old actor’s itch, and recorded a trio of them one Saturday morning. 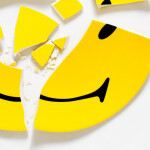 The matter of preparing the tracks so they might present well is a whole other story. There is a learning curve for recording techniques, but I got started with a $2 electotet condensor mic, and free, open-source recording software, called Audacity. To my total surprise and delight, I had a quick response to one of my first auditions, a light crime genre novel called ‘Headwind’ by Christopher Hudson. Chris liked what I’d done with a lot of my audition, but wanted me to try some different voicings, too. I re-worked the chapter, and re-submitted it. With a bit of back and forth, we’d found a good fit between what he hoped for, and what I could do. With another click or two on the project page at ACX.com , we had a contract to make an audiobook! At that point, I ordered some pieces of serious recording gear; a better microphone (the Rode NT-1A, which rocks, btw! ), a stand, better headphones, and a USB interface to connect the mic to the computer. Which brings me to another great thing about ACX: They have pages full of wonderful tips, pointers, and training videos on how to set up a recording space, how to record, edit, and polish the finished tracks. They really want you to succeed! 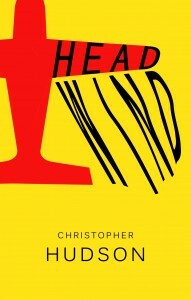 And here it is, now finished and available for purchase, the audiobook of ‘Headwind’ by Chris Hudson, and narrated by yours, truly! Find it at Amazon or through Audible.com. And if you enjoy a good car chase scene… Please visit my professional web at Spoken Arts . 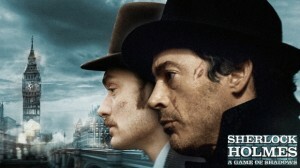 On Christmas Eve, I took my wife and daughters to go see the new Sherlock Holmes film, ‘A Game of Shadows’, and we all enjoyed its clever re-imagining of the detective as played by Robert Downey, Jr, a rather darkly comic version of the sleuth, with equal parts ninja and omniscient adept. While Ann has a low threshold for weapons that go bang and graphic puncture wounds, despite plenty of those even she pronounced the film a good one. Go see it, and its predecessor, if you enjoy the Holmes cannon on any level. You’ll be glad for it. This Christmas did have a new release from Laurie R. King for her Mary Russell series with Sherlock Holmes (out last September, actually, but close enough), ‘Pirate King’. Alas, my girls and I are so addicted to those that we read it before October was done, so it had no place in our stockings last week. It’s a larky sort of Mary Russell novel, with distinctly silly bits to it, and so harder for me to warm up to, but sustaining enough, I suppose. It’s my hope that King’s next in the series has harder edges. 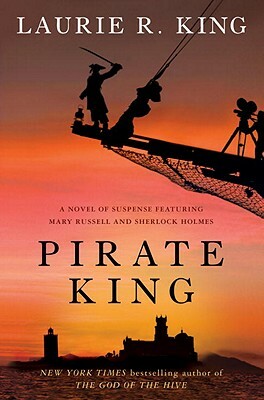 Even so, if you enjoy Russell and Holmes, it will suffice. And just this morning, I stumbled upon this review at Tor.com, by Niall Alexander, of a pair of Neil Gaiman stories which have expanded the Holmes canon; magnifying and extending it into unanticipated realms. It is a beautifully written and illustrated homage to Gaiman’s extraordinary skill and finess as a crafter of stories. I mention it here to point my daughters at the link, and at the two Holmes stories it covers: ‘A Study in Emerald’ , and ‘The Case of Death and Honey’. Alexander has piqued my curiosity, and I’m off straight-away to re-read the first, via the link above. 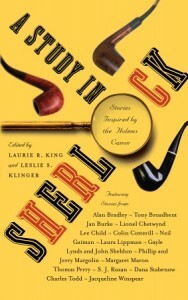 ‘The Case of Death and Honey’ may be found in the new release on the Poisoned Pen imprint, ‘A Study in Sherlock’, which is a collection of Holmes stories by contemporary writers. It’s my fervent hope that some deductive skills will have rubbed off on me from all this recent contact with the great detective. Then maybe I could figure out who sent us the gift of a new corkscrew this Christmas! Ho, ho, ho! This feels awkward, because ‘All Clear’ is not so much a sequel, but is in fact a second half of its counterpart, the earlier novel, ‘Blackout’, which I reviewed prevously here. 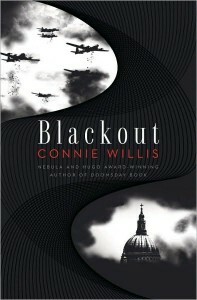 My assessment of ‘Blackout’, could be described as “tepidly enthusiastic”. I was so enthralled by her work,’To Say Nothing of the Dog’, and was primed for some wild kind of “book-gasm” with ‘Blackout’. Well, I was disappointed, but hopeful as I launched into ‘All Clear’. When I wrote my little review of ‘Blackout’, I should explain that I had no conception of Ms. Willis’ stature and success in the SF/F genre. Holy cow! Ten Hugo Awards, seven Nebula Awards, (which INCLUDES the award for ‘Blackout/All Clear’), and a flotilla of nominations besides. So why, I ask myself, does this monumental and highly regarded dyptych still leave me unimpressed, and, frankly, a bit confused? I think it comes down to this: that some “genre writing” (as one author recently referred to a conglomerate of SF/F/YA books) doesn’t necessarilly require nor focus on STORY as its main staple for the reader, or maybe a tight, well-crafted story. The Aristotelian model of beginning, middle, end, with lovely, crisp story-arcs, that sail and rebound like the path of a tennis ball in a spirited volley; THAT is what I was left craving as I read through the 1000+ pages of Willis’ masterpiece. This book hinges much more on setting, atmosphere, the ephemera of bric-a-brac, costuming, the tinge of colors borrowed from other literature of the time and place of which she is writing. It IS brilliant, and wonderful in its way, and necessitates a wholly different approach to the reading of it to extract and enjoy its savor. Alas, it requires work and patience. Two other comparisons come to mind: these books flow and feel a bit like quest-gaming. Reading them reminds me of my hours spent in the world of Zelda-Twilight Princess. There’s such sumptuous detail, and a grinding journey through a hazardous world. The other comparison I would make is that of listening to complex music. You cannot breeze through a 40 minute sax improv by John Coltrane, and you cannot breeze through ‘Blackout/All Clear’, but you would do very well to devote the energy and attention to either. In the wake of reading the most recent Thursday Next novel, ‘One of Our Thursdays is Missing’, I found myself reaching for an earlier volume,’First Among Sequels’ and re-reading it, in doing so, I discovered that ‘One of our Thursdays…’ is actually a kind of re-boot of ‘First Among Sequels'(TN-5). This is interesting, because I hadn’t realized that the practice was becoming commonplace, or could work so well, but I’ve noted it in the work of at least one other writer in my reading of late (John Scalzi’s ‘Zoe’s Tale’, as a re-working and re-release of ‘The Last Colony’). And in this case, Fforde hasn’t actually re-written TN-5, but he HAS appropriated a lion’s share of the groundwork of the earlier novel, and re-imagined it afresh. In ‘One of Our Thursdays…’ he provided yet another construction of his BookWorld, with vast interconnected islands of the genres, transit between them in flying taxis, the mechanics of life for its populace, to include the sundries of life as a book character, the politics of the place, and the special role of his heroine, Thursday, in stabilizing it all. The real Thursday Next is, as you probably know, an Outlander; not of the BookWorld, but deeply concerned with safeguarding it. Then there are the various iterations of the “written” Thursday Next. Both of these novels hinge deeply on the relationship and interaction of the real Thursday and her written representations. All of this material is the mortar and brickwork of the newest TN novel. Re-visiting ‘First Among Sequels’ has made that much clear to me. That said, I’m also delighted to report that the additional work does no harm to the earlier book, and magically avoids feeling stale or repetitious in the new one. The whole TN canon is a wonder of imaginative, playful, literary delights. My hope is that Fforde tries this approach again. I’ve got to begin by saying that it took more than one start at the preceding work, ‘To Say Nothing of the Dog’, before I came to appreciate and love that book. (see this review ) In that instance I decided that my initial resistance derived from the distinctly quirky characters combined with the slow pacing in that work. Both of those qualities eventually become advantageous, especially in counterpoint to numerous plot turns and prat-falls that leap at you in it. Willis’ follow-up, ‘Blackout’ does not lack for quirky characters and slow-pacing, but, alas, the cook seems to have left out a necessary sufficiency of cunning plot-turns and prat-falls. There is action, but very little sense of forward movement in this novel. A set of characters does have a very significant, shared problem, and individual subsidiary problems engendered by the MAIN problem, which is that they are all time-traveling historians trapped in wartime England during The Blitz, but these characters are so ponderously slow to comprehend and act on their situation, I kept finding myself snarling advice at the leaves of my copy, or pleading with them to change direction. They didn’t listen. Set aside the plot problems, Willis DOES have an historian’s love and eye for detail, and this work is resplendent with it. And, too, she has an historian’s love for History, itself. 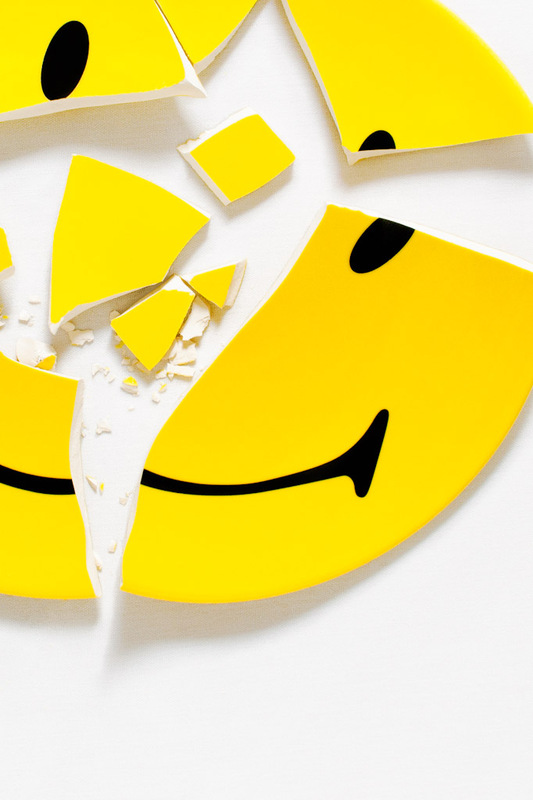 The history her characters are living through is the real center of this work, and the central story is one of a besieged citizenry waging war by sheer endurance, courage, and good humor. That is a story worth telling, but it’s a story of gritty daily privation and nightly fearful hiding away from the bombs in shelters. It’s difficult to incorporate any kind of quest within that story. The time-travelers’ problem of returning “home” to 21st century Oxford, along with their angst that one or more of them may have altered time’s fabric is too hackneyed to serve the need for a unifying quest, especially in a novel approaching 500 pages, and closing with an aggravating, “…To be continued!”. Alas. Yes, the novel does NOT conclude in any way shape or form when you reach the final page. 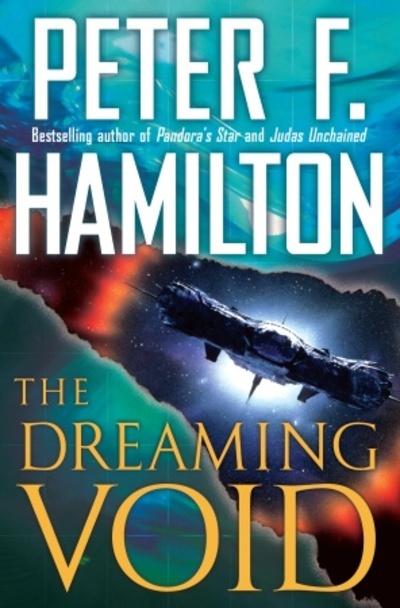 I had this exact problem with another bulky science fiction work I read recently, ‘The Dreaming Void’ by Peter F. Hamilton (see the review ). It’s not insignificant that both books were gifts from the same daughter, (Hmm…) but to the girl’s credit she also gave me the sequel, Willis’ ‘All Clear’. I started it just last night, and have hunkered down in the shelter of my armchair to transit the 600-some pages it offers. I am placing my faith and hope in Willis drawing all the threads into place, and hope to report that it proves to be a tapestry worthy of the The National Gallery in London. 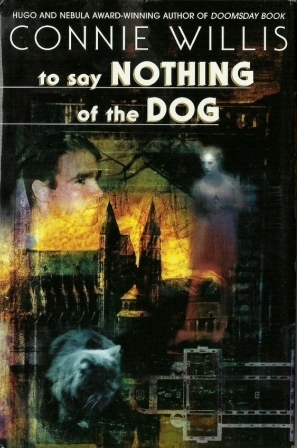 ‘To Say Nothing of the Dog’ , as I came to read it in its entirety, is an interesting story, for I had started it once some years ago, and failed to progress in my reading of it. The failure, time has shown me, was entirely my own. For whatever reason, the distractions in my life prevented me from realizing what a jewel of a story Ms. Willis had crafted. I simply didn’t know what it was I had in my hands, and so never got beyond the first chapter. It worked something like this: this is supposed to be a time traveler’s story, and here’s this odd crew of weird academics picking over the wreckage of the cathedral at Coventry after having been firebombed by the Nazi’s in WWII. Their incompetence is exceeded only by their fatigue. Their quest is to find a missing piece of Victorian bric-a-braq called “The Bishop’s Bird Stump”, and this at the behest of a tyrant-boss who needs to copy it to decorate a modern knock-off cathedral being built in the mid-21st century. Somehow, this wasn’t the time-travel yarn I was looking for at that time. However, it should have been. What doesn’t immediately make itself known about Willis’ book is that it plays on so many different levels at once. 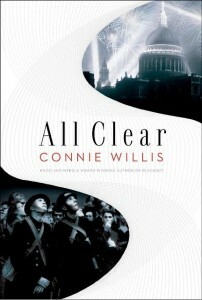 It is as much about a future time when when historians might mine the past in person , as it is a gentle exercise in lampooning the Victorians both in person and through their literature, AND in the context of a cosmos that is as forgiving of our tinkering with time as Willis’ Victorians are of her lampooning of them. It was my older daughter who eventually turned my attention back to this book, when she, in her quirky manner, quoted a meme from it, unreferenced, as her Facebook status one evening. She posted, “We are all, in a sense, Ensign Klepperman.” This game requires that I figure out what the heck she is referring to, and few google searches later it came to me in a flash that these words derived from the odd time-travel book I’d started and never finished some five years before. Klepperman’s story and person are but a sidebar to illuminate the tasks of Willis’ protagonists as well as her greater themes in this tour-de-force, but to say how in this review might be telling too much. This much can be said: it is a truly great piece of fiction that can mull over more than a few profound questions about the relationship between the present and the past with SUCH a gracious and deft touch that the reader hardly senses the depth of the work beneath the constant and ongoing humor, until suddenly GOB-SMACKED by it with near lethal force at the conclusion. I’m at present reading the second work in this series, ‘Blackout’, and in possession of the third such work, ‘All Clear’, so am well positioned to feast on Ms. Willis’ works for some time to come. I’ll write about those too, in time. For now, though, take my recommendation for ‘To Say Nothing of the Dog’ to heart if you think you’d enjoy a warm summer’s journey by boat in Victoria’s England combined with a romp helter-skelter through other times, as well. Actually, I’m only WITHIN STRIKING DISTANCE of finishing this interesting book, which was a gift from one of my daughters more than a year ago. While worthy and, as I said, interesting in many ways, it was not for me a compelling read. Hamilton is gifted but seems to write without any discipline with regard to outlining his story arcs in advance of writing, or if he does so, it is not set out for the reader in any clearly discernible way. However, his gifts and strengths are evident, and lie in his imagination, and the scope of the palette on which he builds his yarns. His weakness is in launching so many story lines at once and flitting between them willy-nilly, so that most readers would be at a loss as to what the hell is going on, overall. And this is exacerbated by the action being spread over thousands (or is it hundreds of thousands?) of light-years of real estate, and an indeterminate amount of time, which could be as few as several Earth months, or as many as several Earth years, if we only had a clue as to where Earth stood in this panoply. Having reported that I’m close to finishing this major work, I must also sadly add that I have NOT a CLUE as to how anything will ultimately turn out. After reading almost 700 pages, I will only be in a good position to set out in the second tome of this TRILOGY. And, being a bit cynical, I despair of knowing any much more at the end of the second book, should I venture on. The damnable part of it is, I might keep reading anyway! Although there are few characters and story lines I much care about, there are some which do interest me. Those are well drawn, inspired in their characteristics and adventures, and might just keep me going. The best I can say of this series is that it would make great television, as it is drawn from a superior imagination, but expresses no clear notion of where it is going so far. New television dramas never seem to suffer as much from a want of long-term story arcs. As sci-fi “popcorn for the mind”, ‘The Dreaming Void’ is very good. Among the great sci-fi novel-series, so far it can only be an also-ran.